Voxx: The World's Most Accurate Psychic ® | Full Moon in Capricorn! The Full Moon will occur at 6:49 PDT (9:49 EDT), and will be at 08:25 Degrees of Capricorn. No doubt you will feel especially emotional, as Capricorn is the exact opposite sign of Cancer, the sign which is ruled by the Moon. The sign of Capricorn is ruled by the planet Saturn, and makes it a very intense time for all Moonchildren, in particular. There is a great deal of craziness going on right now, with Mercury, Jupiter, Uranus, Neptune, Pluto and Chiron all retrograde at the same time! So pretty much everything is up in the air — don’t try to hard to control things, as it’s impossible to get a handle on anything right now. The best you can do is to try to accept what’s going on in your life with the best attitude possible. Once Mercury goes direct again on July 9th, things will start settling down, once and for all. The Positive Side: You can get in touch with your more disciplined side right now. It’s a good time to start any kind of regimen to increase your stamina and strength. The Negative Side: You need to lighten up already! You may feel irritable, vulnerable, and angry right now — violence is definitely on the horizon, so keep your temper in check. Also, this placement is strong for the occurrence of earthquakes, as Capricorn is an earth sign, and rules mountains (and the little goat creatures that climb them). Final Note: This is a very powerful Full Moon, so try to wake up early and meditate on the full level of energy that can be tapped and transmuted to your particular magickal purpose. Capricorn Keywords for Focus: Structure, patience, thoroughness, goal-planning, and strategy. Cancerian Keywords for Focus: Nourishment, security, appreciation and family. Candle Ritual Info: Use the following colours, shapes, and items in your ritual for celebrating the Moon in Capricorn. All items should celebrate the sign the Moon is in, which is Capricorn. Colours: Black and Indigo (for Capricorn). Other Objects: Horns, crystal balls, black scrying mirrors. Talismans: The Devil Card (Tarot/Capricorn), garnet, onyx, obsidian and/or any other black or indigo-colored stones. Herbs: Comfrey, Solomon’s Seal, Belladonna (poison), and Snowdrop. Trees: Pine, Cypress, Yew, Spruce, and Holly. 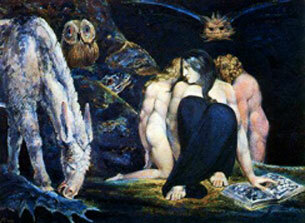 Picture Info: “Hecate” by William Blake. Powerful… I’ll say!!! I went to bed around 3 am but couldn’t help waking up at 8 am (I’m in Colorado). Thanks for the lovely info Voxx. Thanks Heather. Hope you had a good meditation and ritual. In the future, I’m going to try to post ritual info a bit sooner.